1 bedroom cottage, with beautiful scenery over looking the countryside. Peony cottage has a stunning newly fitted kitchen which includes an oven/grill, microwave, induction hob, fridge freezer, and dining area inside. There is also seating area for 2 people at the front of the property and also at the back. The bedroom is decorated with soft pastel colours and included in the price is linen, towels and your own dressing gowns. The bathroom has a newly fitted walk-in shower, there is free toiletries and hairdryer to use. The Peony Cottage is fully heated throughout. There is a double bedroom, bathroom with a shower and toilet, lounge with settee, TV with English and French channels, free WIFI, DVD and DVD's to watch, radio, dining table, and fully fitted kitchen. The Peony Cottage has its own private outside sitting area to relax and take in the views. There is a private use of a Hot tub, BBQ as well and garden furniture. Prefect way to relax or have 'Alfresco Dining'! Set in tranquil countryside with panoramic views over the valley and wooded areas, we are situated down a quiet lane with no through traffic close to the centre of Paule where a small bar, shop and a patisserie can be found and only 0.6 miles from the Nantes – Brest canal. There are lots of places to fish nearby, as well as cycling and walking routes. We are also only a 15 minutes’ drive away from the larger towns of Rostrenen and Carhaix – Plougher which have a number of bars, restaurants, shops and supermarkets. Other activities such as swimming adventure land swinging from ropes and the largest music festival Vielle Charrue. Tour de France 2018 will be passing through our village. We are a husband and wife team who have owned the property since October 2016 and have renovated these buildings to run as a holiday rental business. The reason we settled on Brittany is due to the mild climate, the beautiful scenery, long coastal beaches, quality of food and of course the wine is excellent. Due to tranquil setting, beautiful and peaceful scenery and the charming style and original features of the properties. We fell in love with the place. The property is central to Brittany and great place to explore the northern and southern coastal areas. The cottage has its own private space for sitting outside and its own private heated hot tub to use. Walk in shower, sink, toilet and towels are provided. Washing up liquid, cleaning products, toilet rolls, salt/pepper and tea and coffee available. Fully integrated kitchen with microwave, oven/grill and an induction hob/extractor fan. There is plenty of utensils and cooking equipment for you to use if required. Dining area inside the property that sits 2. Outside of the property there is a table at the front that seats 2 people and also seating area at the back that also seats 2. French and English channels available. We can arrange bicycle hire for you if required (this will be an extra fee). Just to note people wanting to use the hot tub please inform us prior to your visit and we will prepare this for you. All guests who are staying 2 or more nights will get a free complimentary basket. 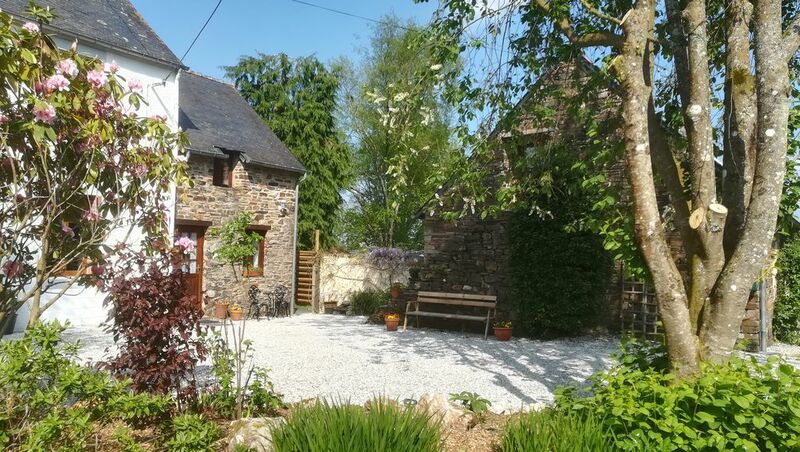 Set in tranquil countryside with panoramic views over the valley and wooded areas, we are situated down a quiet lane with no through traffic close to the centre of Paule where a small bar, shop and a patisserie can be found and only 0.6 miles from the Nantes – Brest canal. There are lots of places to fish nearby, aswell as cycling and walking routes. We are a husband and wife team who have owned the property since October 2016 and have renovated these buildings to run as a holiday rental business. The reason we settled on Brittany is due to the mild climate, the beautiful scenery, long coastal beaches, quality of food and of course the wine is excellent.